Fusion cooking is one of my favorite. Playing around with traditional and non tradition ingredients is really fun. I love Indo-Chinese dishes, it’s really easy to cook and tastes simply superb spiced up with Indian seasonings and Chinese cooking style. Gobi Manchurian falls into this category. A delicious blend of Indo- Chinese cooking, which has been Indianized by local folks to satisfy the taste buds of desi’s who crave for something spicy which serves as an appetizer and also a side dish. These kinds of dishes are found only in Indian restaurants. Pluck the florets from the Cauliflower and cut them into bite size pieces. Take a blow and mix all the dry ingredients (maida, corn flour, salt and chilli powder) slowly add water to make a batter for cauliflower fitters (similar to bajji batter). Heat oil in a deep pan or kadai , dip the cauliflower pieces in the batter completely and fry them until light brown, remove and drain the excess oil on a paper towel. Heat, 1 tablespoon of oil in a skillet or wok, add chopped garlic, ginger, spring onions (white) and green chillies and fry them until they start to turn brown. Add the remaining ingredients listed below sauce except for corn flour mix and cook for 2-3 minutes. Now add the corn flour and mix well (without lumps). Add fried cauliflower fitters and mix well. Garnish it with reserved spring onions. 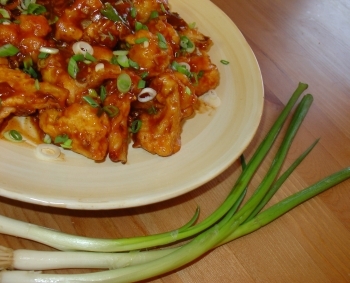 Serve the gobi manchurian hot with your choice of meal. I made it wet to go along with fried rice. Skip adding corn flour and add capsicum and onions for crunch. Depending upon how hot you like it, you can add/reduce the pieces of green chillies and white pepper. Adjust the amount of ginger and garlic according to your taste, Depending on how dry/wet you like your manchurian, you need to reduce/add the ketchup, Soy sauce and cornflour mix. 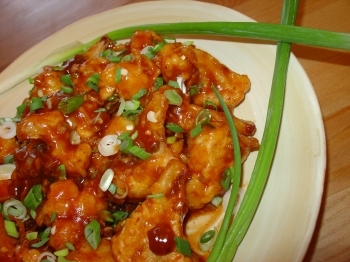 For a little kick you can add 1 tsp of ginger green chilli paste to the batter before adding cauliflower .